The day before Christmas Eve, our family was thrown a bit of a curve ball. Noah began the day vomiting -- something I don't remember him doing since he was 2 years old. In fact, he was so surprised by the occurrence, all he could do was sit on the bed in shock and say, "What is this?...I don't do this." With Christmas plans hanging in the balance, I stocked up on 7-Up, Saltines, Jell-O and Lysol and prayed Noah would make a speedy recovery and that no one else would come down...er, up with it. Christmas Eve Noah was feeling much better, but wasn't eating much more than dry toast. Natalie was bouncing off the walls in anticipation for Christmas. She wanted to go to bed at 6 p.m. in hopes that Santa would stop at our house earlier. 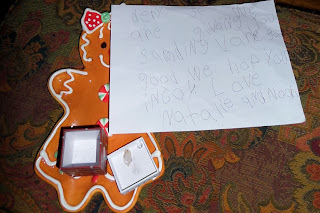 The kids left out cookies, a letter and a box filled with two of their prized possessions - a crystal and a glass bead. In case you aren't well versed in 1st grade writing - the letter reads "Dear S.C - We are giving you something very good. 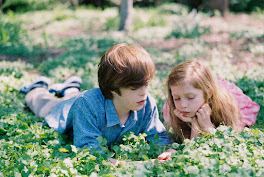 We hope you enjoy, Love Natalie and Noah." Yes, a coconut. For months, Natalie, with her zany humor, has been substituting the word coconut into topics of conversation. For example, "Natalie, what do you want for breakfast?" - "A coconut." "Natalie, how'd you sleep last night?" - "Like a coconut." So, Steve and I decided to buy one, wrap it and give it to her for Christmas. At 2:50 a.m. I awoke to squeals of "Santa came!...He was here!" I told the kids I wasn't getting up until the first number on the clock was a 6. At 3:30 a.m. Natalie came into our room to tell me her stomach hurt. I bolted upright, "What! Are you going to throw-up? Where's a trashcan?!" "No. I'm hungry," replied Natalie. "Then go pour yourself some cereal," I said. This was followed by an audible sigh from Natalie. I think she thought if she could just get me up, then she could convince me to let her open her presents. 4 a.m. Natalie is back with "Noah pinched me!" "That's it! Everyone back to bed," I barked. Reading their letters from Santa. Santa sacks - a few years ago the kids received the sacks and a letter from Santa that in an effort to be more green, he wouldn't be wrapping presents. Instead, they are to put out their sacks for him to fill. A Yoda clock it is. Natalie smirks as Steve opens the gift she bought him with her own money. Obviously thrilled with Steve's reaction to her gift to him. We spent the day at my folk's house chowing down on a variety of red meats, deviled eggs, pies and cookies. Diets be damned til the first of the year. Mom cuts into one of my sister-in-law's pies -- coconut cream with a chocolate coconut crust and the other a peanut butter and banana pie with vanilla bean custard. Natalie was so excited to show everyone her coconut and insisted on having Steve cut it open at Grandma's house. Having not ever opened a coconut before, Steve sought advice from the Internet. Turns out 2 or 3 whacks on the "equator" of the nut and voila! It split in two. After we had all had our fill of food, we opened gifts from Grandma and Grandpa. Here -- Jack only mildly affected by receiving a couple of new Skylanders. Ethan, my teenage nephew, a sweetheart and very happy with receiving an iTunes gift card. Ella -- very excited about learning to sew. Dad had her guessing...he added one of his weights to her package. I am going to try that weight idea. My husband is notorious for guessing his gifts before unwrapping them.